From the tender age of 14, Oliver Grabes knew that he wanted to pursue industrial design. He liked cars, he liked objects, and wanted to have a hand in shaping these things. "I knew I had to become an industrial designer," Grabes says. "That was lucky in that I didn't have to make up my mind of what to study; it was more a question of which design school to go to and which branch of industrial design to pursue." 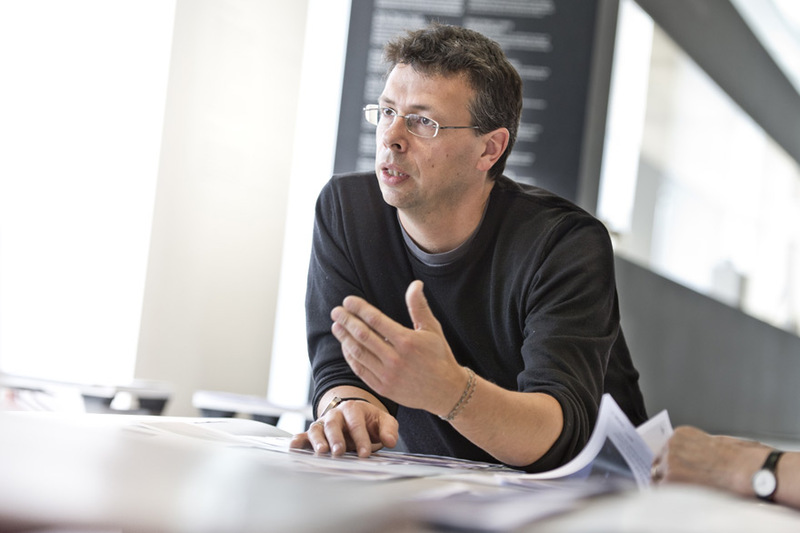 After earning a degree in product design from Offenbach College, Grabes spent nearly twenty years working for design consultancies, from his native Germany to Seattle to London. Cutting his teeth on technical products in the '90s, before user experience became a part of the public consciousness, was a good time to learn: "Using a computer was so awful at the time, that I really started to become aware of how design had the potential to help make technology be a great experience for people," Grabes explains. "You saw, fundamentally, why you got into design; you saw there was a real need for making technology more human, giving people an easier, better, more intuitive experience of using it." 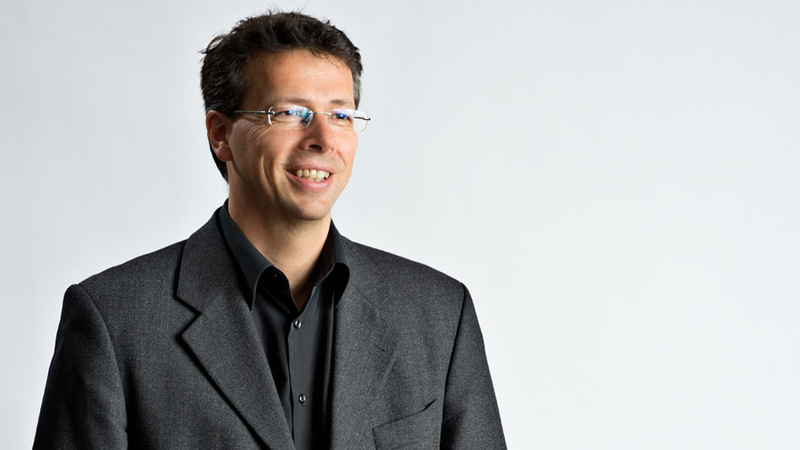 In 2006, having done work for the likes of AT&T, Boeing, Bosch, General Electric, Microsoft, Sony, Nike and others, Grabes became a Professor of Industrial Design at the University of Wuppertal, which has one of the highest-ranked ID programs in Germany. And when Braun asked him to become their Head of Design in 2009, the opportunity was too good to pass up. Braun had been aware of Grabes' work for years, but Grabes had admired Braun's work for decades—here he shares his thoughts on growing up with Braun, Dieter Rams' legacy and how to get a job at Braun. Core77: As a youth, what were some of the earliest objects whose design you became aware of? This sounds a bit awkward, but it really was many of the Braun products at the time. 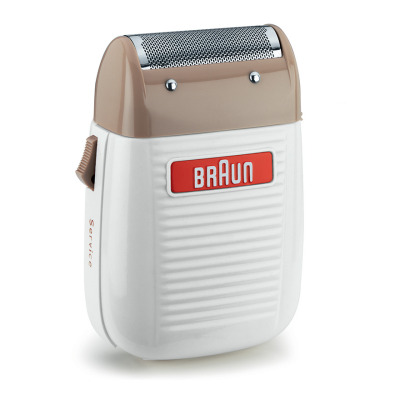 Growing up in Germany, there were very few families that didn't have at least one Braun product at home, because they made so many household products—we had them in the kitchen, the bathroom, the living room. I was particularly fascinated by Braun audio products at the time, like the famous Atelier stereo system. We didn't have one of those. My friend's family had one and when I would go to their house, I would study it very closely.Going back even earlier to when I was very young, I remember the coffee machine that my parents were always using in the kitchen. I later found out it was the KF 20, but of course I didn't recognize it was Braun as a young boy; I just remember liking the coffee smell and the way the machine looked. At that age you don't question it, it is this machine, this object, that is part of your growing up. It must have been interesting to be approached, years later, to become Braun's Head of Design. What did you think when that happened? I thought, well, it's a very challenging, but also compelling task to undertake. Challenging because it's not easy to move the brand back to where it was, if we can do that. But it's great to head in that direction, working to bring design back to Braun again. The design team here is very important, and it was great to find they are totally aligned with what needs to be done, and what we want to do together. How does Braun Design work, organizationally? 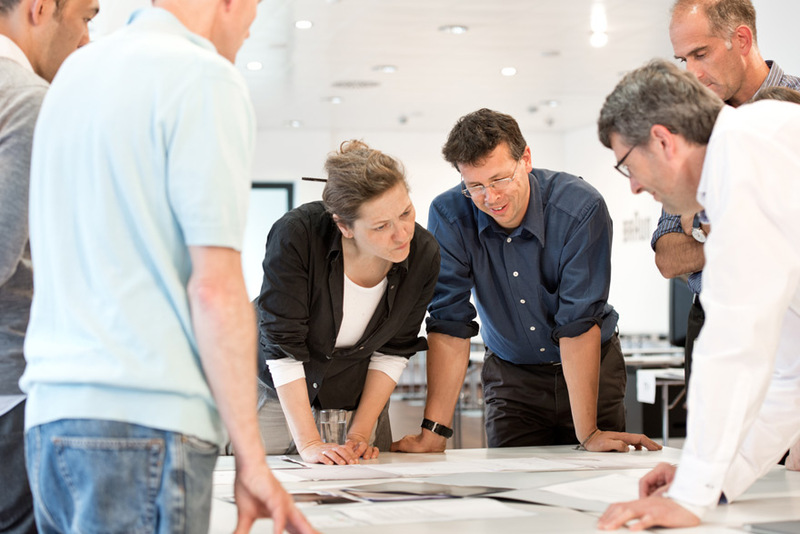 Our team here in Kronberg is like an industrial design consultancy that is working within Procter and Gamble. We're 29 people at the moment—industrial designers, graphic designers, packaging designers, interaction designers, CAD specialists, modelmakers--a mix of whatever you need to create great design models. And we're very much connected to the technical teams, which are located here at the same campus, in the same building, which is a great situation—our industrial designers can go back and forth with working with the technical guys every day. So we can, in an iterative process, create high quality in a very short, simple development process rather than, you know, by email. So that's the general setup. There's several categories that we do the work for. Mainly Braun—shavers, epilators, hair care product like straighteners and hairdryers—and the licensing partners, like with the timepieces, where we're not manufacturing the products, but are doing the design work for the new clocks and watches that are developed. And we do design work for other brands within [parent company] Procter & Gamble, like Oral-B. Earlier you spoke about bringing the brand back to where it was. 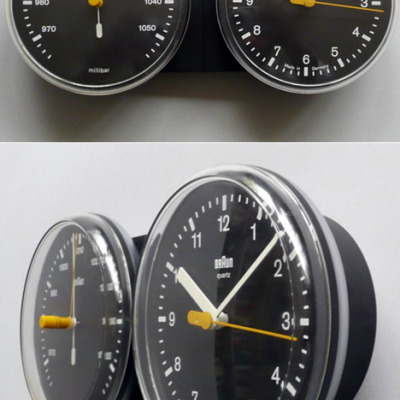 With the new line of Braun-branded timepieces, they clearly carry that design DNA from the Braun of decades past. Is that possible in the other product categories, or has the technology simply advanced too far? The razors of today, for instance, are obviously completely different from the ones in the '60s. Right, there's a fundamentally different archetype of what people expect from a modern or a contemporary shaver, versus 30 or 40 years ago when the Braun shavers were the archetype of what a shaver should look like. At that time, it was, like, one block with a graphically separated metal head that was the tool, and the handle was a black plastic part. And it was all integrated into one very simple design, with just one foil and there was no adaptability of the head itself. Today that's different. With contemporary shavers everybody expects several foils to be more efficient than just having one. You expect the head to be articulating, and an ergonomic handle capable of more comfortable holding positions. So fundamentally, if we simply returned to the prior form factors, it would look very old-school—not look like a contemporary product—and would have ergonomic disadvantages compared to the new products. What we do want to keep and bring into the new product is, of course, the values and the look and feel of the old products. For example, the very brand-connected dots or dimples, to bring those back. To have the rubberized grip elements and a durable metal head that communicates the longevity and the quality of the product itself. Something where if you have it in your hand, it just feels very solid, very high-quality and well-done. Another goal is to be a bit more timeless than our competitors that might go for a more extreme design. We want to nicely balance between being contemporary and being connected to our equity elements that we have from the past. You mentioned how early Braun razors became the archetype for what an electric shaver should look like. 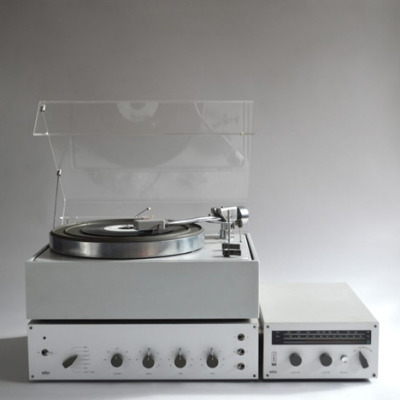 In my research, I'm surprised at how many times Braun defined the form factor when nobody knew what a turntable should look like, or a coffeemaker, or a razor. Was that only possible in the 20th century, when those objects were completely new? Do you think we can ever see anything like that again in terms of setting the form factor? It's a good question. If you look back at the history of Braun, you see both a revolutionary new approach to products but also, very often, taking existing technical platforms and redesigning them to be cleaner, more clear, direct and minimalistic. 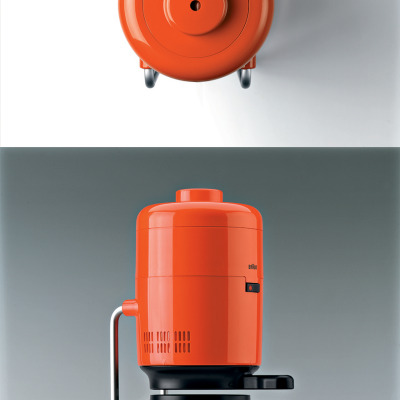 Making sense of the object with as few elements as possible was what made Braun very unique, with designs that were truly all they had to be, but nothing more than that. That less-but-better approach from Dieter Rams that we all know of, creating a very authentic, very honest product. And I think that still is possible today, even though the environment is different. For a certain time, I think we haven't done that; we sort of lost it in terms of keeping products simple and pure, while others—the great example is Apple, of course, and companies like MUJI—continued to go in that direction and were really doing this really well. Those companies have helped to establish an openness in society of being attracted to simple but well-done products. That can help us to connect to what we have done in the past and to make that look contemporary again. I'm not sure if creating totally new product propositions is really needed, but I think establishing your brand in existing product categories is. And having a point of view in these categories that connects to people that like higher quality, timeless products that last longer and are more sustainable, that do a better job over the years. That's the position that we want to be in; our design goal is to achieve that again. How do your design challenges differ across product categories? Most of our products are hand-held tools. Not like smartphones; those are hand-held tools where your thumb is moving a lot but otherwise you just hold it in your hand and look at it, you don't do a lot of physical action with it. That's very different from one of our power toothbrushes—you move them for three or four minutes on your body, in your face. That's a mechanical action, and the design needs to guide that action. It's strongly ergonomic-related, more than many people think; when you do a certain action for a very short time where you don't have to move a lot, it doesn't matter that much. But if you do it for several minutes, it actually makes a big difference regarding how that appliance works. The details have to be designed. And with our hand-held products, we're after what we call "fluid geometry"—a connected geometry where we try to provide things with a controlled, soft, elegant overall gesture. We also create products that sit on the kitchen counter, or our alarm clocks, which a user has very little ergonomic connection to, where you just push a button or switch something on and off. With those, where extreme ergonomics is not required, we want to get back to the more simple architectural forms connected to our past. Speaking of which, how old is your current generation of design staff, are they aware of Braun's design history? Of course, we make this a must—if they aren't, they immediately get fired. No, no, no, that's just a joke! All of our design staff are here because they wanted to work for the Braun brand, having a strong knowledge about what Braun has done in the past for industrial design, for modern design. Our average age is probably between 25 and 40. What we all have in common is the desire to make sense of objects in a way that is functional and honest. For a fresh design graduate that wants to work at Braun, what do you need to see in their portfolio? Something that shows they understand the magic of making things very simple, but at the same time, compelling. Finding, with little elements, that sweet spot where people are fascinated by an object and feel as though "of course it had to be like this." When things are designed well, you feel it had to be that shape or that form or that material because it makes sense. We also like to see when people have an antenna for understanding things differently—understanding how people could use an object, and making and suggesting a little change. That's something that creates that magic of products that we like, but that aren't designed in an extreme way, where they need to shout that they are different with an extreme form, pattern or colors. Those are qualities that we think make sense. Speaking as a professor, I think that's something that a lot of people are looking for, because it is putting design in the right place: Solving problems for today's world, and making things that are lasting. We want to have people that want to change the world by creating, as Dieter Rams called it in the past, good design. Thanks to Oliver for taking the time to speak with us. As the jury captain for the Consumer Product category of the 2013 Core77 Design Awards, he will be announcing the winners of that category with his jury team at 12pm noon EST next Wednesday, June 12.